Another day in the mountains, with 127 km rather short though again requiring your patience as you climb up the 2.355 m of elevation for today. Unlike the day before the terrain is more varied, and we have two climbs. The longer one will begin right away, taking us from just under 250 m to nearly 1.000 m. Climbing will be easier than on Mont Ventoux as it is less steep expect for a few passages. You may want to stop for coffee and refreshment at La Motte. A few km up the river the route will leave the river to take us higher up into the mountains. About 60 km into the ride the tour reaches the first peak, and we will be flying down 600 m until we reach Die, where I suggest to take another break and stock up on water and food. The following 20 km will be the second major climb for the day, taking us 1.000 of climbing up, with a series of hairpin turns towards the end. Unlike Mont Ventoux I expect this stretch to be less crowded by cyclists but possibly there will be more traffic. The Vercors is a rather remote part of France with no larger cities. On the other hand, there are just a few roads leading into the mountains, and ours is one of them. Towards the end we will have a bit of climbing to do, but nothing major measured against what we have conquered during the day. 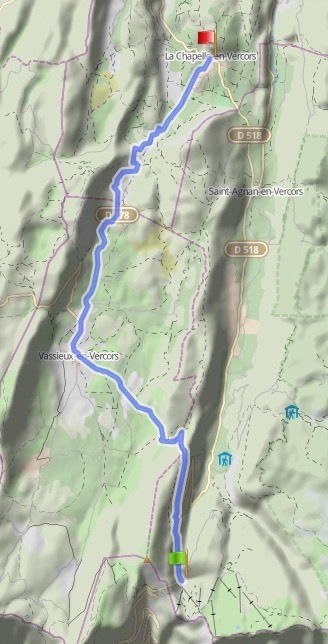 The final uphill will take us to our destination, La Chapelle-en-Vercors, considered to be the Vercor's "capital city". Here, in the heart of the Vercors, we will end the day. A Swiss rider has alerted me to a nicer route up in the mountains and I suggest to consider it. The alternative begins at the summit overlook after the tunnel (the car park). Instead of taking D 518 from the summit, this option keeps left and follows D 76 and D 178 to reach our destination via Vassieux. So, turn left on D76 at the fork with D 518, going up instead of down — it is not steep and does not take very long before the route drops down on the other side of the ridge we went up to before. The road to follow will require some care, but it could possibly be the best section in all of these three weeks. Views will be spectacular and it looks like it is less climbing than the original route. 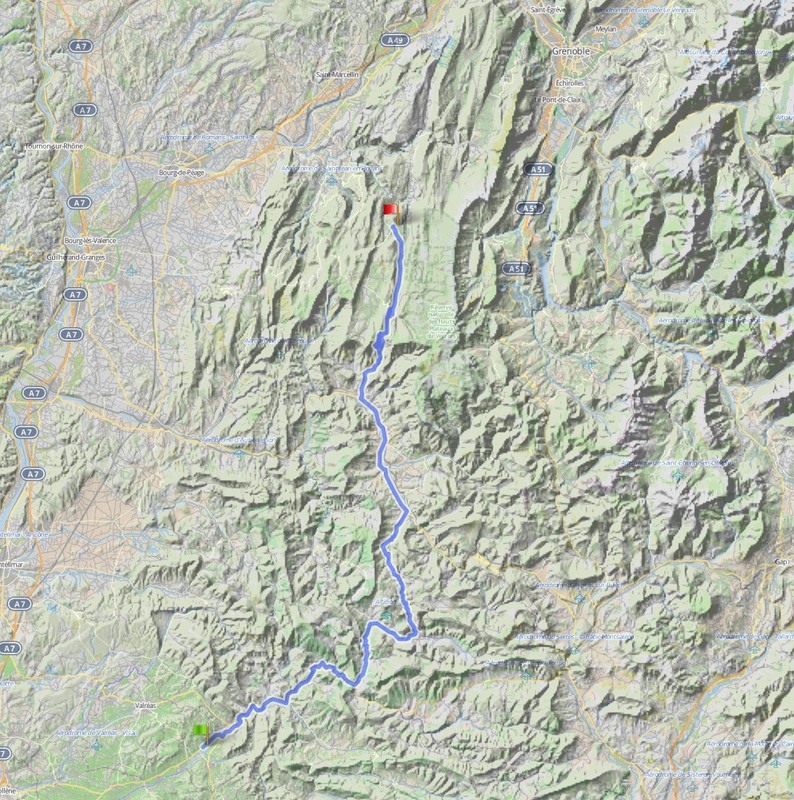 See the map on the left and the elevation profile above.